Last year Lucy Cooke traveled to The Aviaros del Caribe Sloth Sanctuary (now called The Sloth Sanctuary of Costa Rica) and made Meet the Sloths, an adorable video about the sloths living in the sanctuary. Since then, Cooke has been working on an hour-long documentary titled Too Cute! Baby Sloths which will premier December 17, 2011 on Animal Planet. In a sleepy corner of Costa Rica there is a very peculiar sanctuary. Devoted to saving orphaned and injured sloths. The dangerously cute baby sloths lead quite busy lives and have to attend sloth school to learn the ways of the sloth. 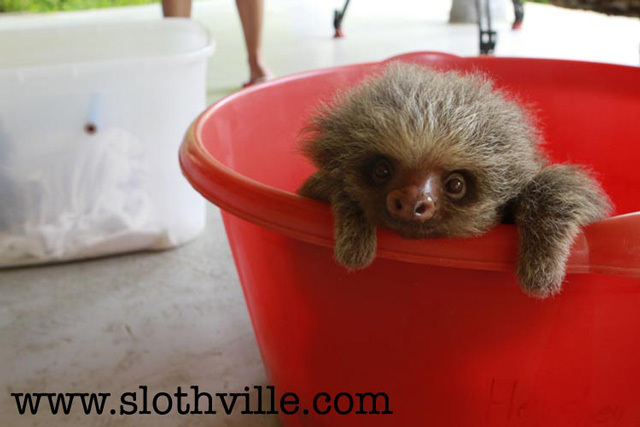 Cooke’s Slothville website is “a place to celebrate the world’s laziest animal”. She is also working on a book, The Little Book of Sloth, for Simon & Schuster.